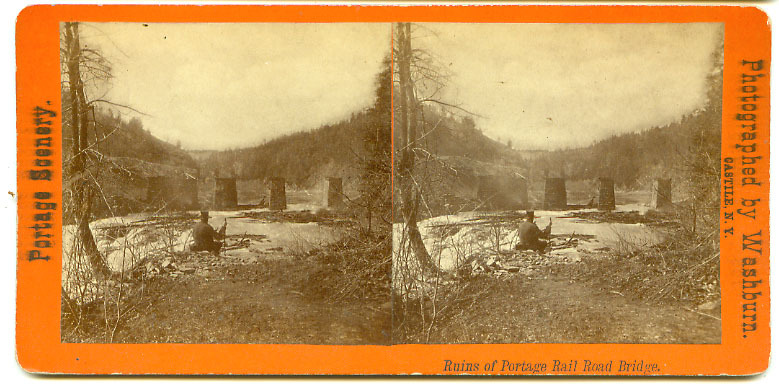 "Ruins of the Portage Rail Road Bridge." Many of the photographers who had taken images of the Portage Wooden Bridge hurried to Portage when they heard the news of the great fire. These photos mark the only time since the invention of photography that a railroad bridge didn't cross the Valley above the Upper Falls of the Genesee. For more information on the Bridge and fire, see our Glimpse of the Portage Bridge, a newspaper account of the fire, and other photos in our historical photo album! "292 Ruins of the old Rail Road Bridge, at Portage"
This image was taken perhaps a few weeks after the one above. Much of the debris has been washed down the River, and planking has been placed across the stone abutments as work begins on replacing the destroyed bridge. For more information on the building of the new bridge, see one of our "Pieces of the Past"